What's your REAL PROFIT℠ Score? And what are the real drivers of your business? Answer the questions below to find out. We’ve distilled over 27 years of experience into a set of simple questions that can identify real and impactful ways for your business to drive profitable growth and maximize long-term value. 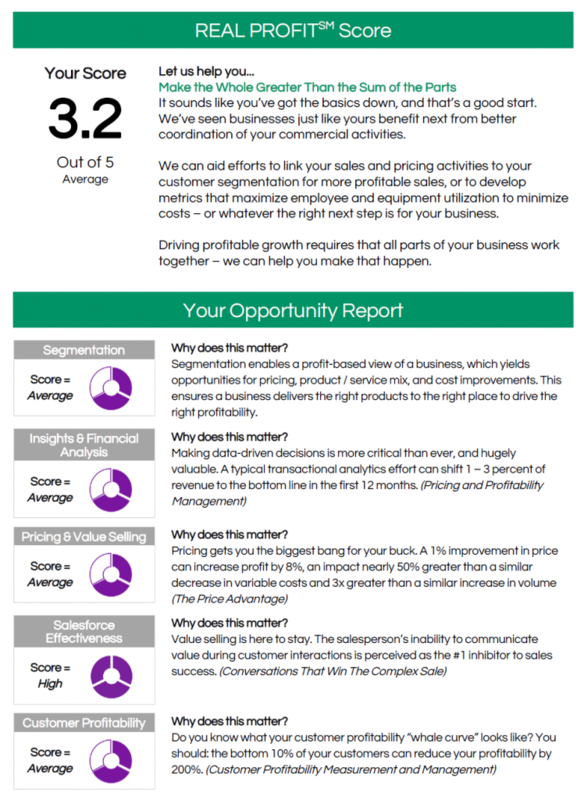 Answer the questions below to get your REAL PROFITSM Score and with it a customized report for you and your business. The report will highlight opportunities for your business to see and realize its full potential. We’ve seen first-hand how all of these opportunities can deliver real results for businesses just like yours. Please enter your contact information to receive your REAL PROFIT™ Score and customized report. Use the link on the results page to download your report. Note: We will never share or sell your information, and this does not add you to an email distribution list - we hate those too.